In the first edition of this widely praised book, Stephen Kinzer made the convincing claim that Turkey was the country to watch -- poised between Europe and Asia, between the glories of its Ottoman past and its hopes for a democratic future, between the dominance of its army and the needs of its civilian citizens, between its secular expectations and its Muslim traditions. 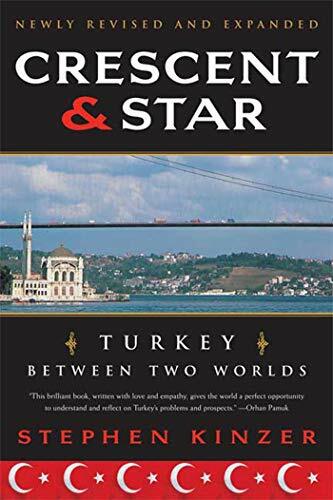 In this newly revised edition of Crescent and Star, he adds much important new information on the many exciting transformations in Turkey's government and politics that have kept it in the headlines, and also shows how recent developments in both American and European policies (and not only the war in Iraq) have affected this unique and perplexing nation. Stephen Kinzer was Istanbul bureau chief for The New York Times from 1996 to 2000. He is the author of many books, including All the Shah's Men and Overthrow. He lives in Chicago. A passionate love for the Turkish people and an optimism that its ruling class can complete Turkey's transformation into a Western-style democracy mark Kinzer's reflections on a country that sits geographically and culturally at the crossroads between Europe and Asia. Kinzer, the former New York Times Istanbul bureau chief, gives a concise introduction to Turkey: Kemal Ataterk's post-WWI establishment of the modern secular Turkish state; the odd makeup of contemporary society, in which the military enforces Ataterk's reforms. In stylized but substantive prose, he devotes chapters to the problems he sees plaguing Turkish society: Islamic fundamentalism, frictions regarding the large Kurdish minority and the lack of democratic freedoms. Kinzer's commonsense, if naeve, solution: the ruling military elite, which takes power when it feels Turkey is threatened, must follow the modernizing path of Ataterk whom Kinzer obviously admires a step further and increase human rights and press freedoms. Kinzer's journalistic eye serves him well as he goes beyond the political, vividly describing, for instance, the importance and allure of the narghile salon, where Turks smoke water pipes. Here, as elsewhere, Kinzer drops his journalist veneer and gets personal, explaining that he enjoys the salons in part "because the sensation of smoking a water pipe is so seductive and satisfying." Readers who want a one-volume guide to this fascinating country need look no further.